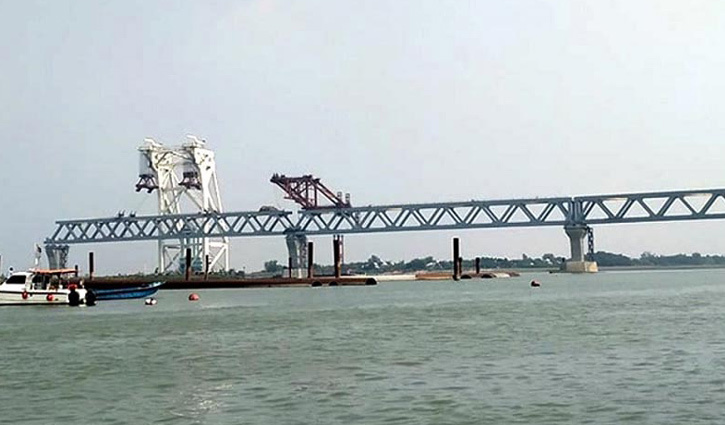 Secretariat Correspondent: The eighth span of the 6.15-kilometre long Padma Bridge was installed on Wednesday on its 35th and 36th no pillars at Jajira end in Shariatpur. The 150-meter long ‘6E’ span was installed around 12.15 pm, making 1,200 meters of the main structure of the mega bridge visible. A total of 1050 meters of the bridge were visible at Jajira point with the installation of the seventh span and one was installed at Mawa point making 150 meters visible. The “6E” span has been successfully placed on the pillars with the efforts of local and foreign engineers. Another new span titled ‘6-D’ is expected to be installed on the 34th and 35th pillars of the bridge at the Jajira end by March 10. Earlier on October 14, 2018, Prime Minister Sheikh Hasina unveiled the name plaque of Padma Bridge Toll Plaza at the Mawa end. The fourth span was positioned on May 13, after two months. After one month and 16 days, the fifth span was installed on June 29 while the sixth one was placed on January 23, 2019. According to the engineers concerned, a total of 41 spans will be installed on 42 concrete pillars to complete the bridge.